The 2013-2014 beijingkids Health Guide is the latest resource for Beijing families dedicated to providing information on family health care, maternity, eating and breathing safety, mental health, emergency care and traditional Chinese Medicine. Articles from the guide will be featured twice a week on our website. Find the full version here. A recent study from The Chinese Society for Environmental Sciences revealed that the average incidence of asthma amongst children in China is a staggering 6.8% and rising. With asthma now being stated as the leading cause of hospitalization amongst infants in China, expats need to be well prepared for the pollution that they and their families are inevitably going to be exposed to in Beijing. 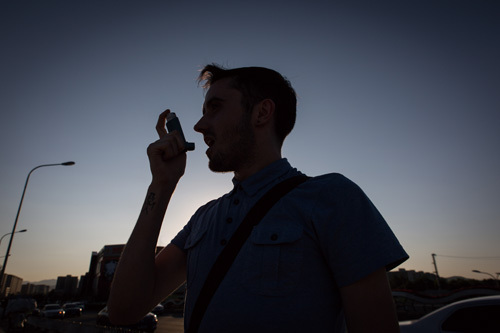 Dean Phelan is 23 year old Irishman living in Beijing who suffers from asthma. He describes his asthma as quiet severe at home in Ireland but says that it has been a lot worse since coming to Beijing. “As an English teacher I have to avoid running around with the children during playtime completely if it’s a very polluted day. I can’t do it without gasping for breath,” he says. “Even running for a bus or climbing a flight of stairs was completely out of the question for me this winter when the pollution was at an all time high.” Phelan also stated that during the winter over 1/3 of his class was absent because of the pollution. “A lot of the parents actually took their children out of Beijing and back to their hometowns just to get them away from the pollution.” he says. And although masks can help reduce pollution intake, they can be somewhat impractical because people just aren’t committed to wearing them. “Of the 24 children in my class, only one wears a mask on a daily basis and these will include many children that come in coughing and wheezing on a regular basis,” says Dean. He also cites the lack of smoking ban in China as a problem for him. “Shisha pipes are definitely a personal trigger of mine. When I’m going out I would actually take the smoke levels of a bar into consideration, especially if they sell shisha pipes. Any incidents I have had over here have occurred after being exposed to smoke from shisha pipes. I just can’t be around them,” he says. Dean says that he “could never live in Beijing permanently. I can already see how badly it has affected my health,” he declares. Every city has its ups and downs, but in Beijing’s case there is little one say to downplay the severity of its air pollution. It can be bad as people say it is and is a serious consideration for people who suffer from breathing problems. No matter how long you are committed staying in Beijing you should be proactive and practical about protecting your lungs while you’re here. This article originally appeared on page 40-41 of the beijingkids Health Guide. Click here to see the Health Guide in full. Some of the articles covering the seven areas (family health care, maternity, eating and breathing safety, mental health, emergency care and traditional Chinese Medicine) within the guide will be featured twice a week on our website. or call 5820 7700/7101. You can also browse the contents and comment on the beijingkids website.